III. Both players in a team and one player engage to the other one. 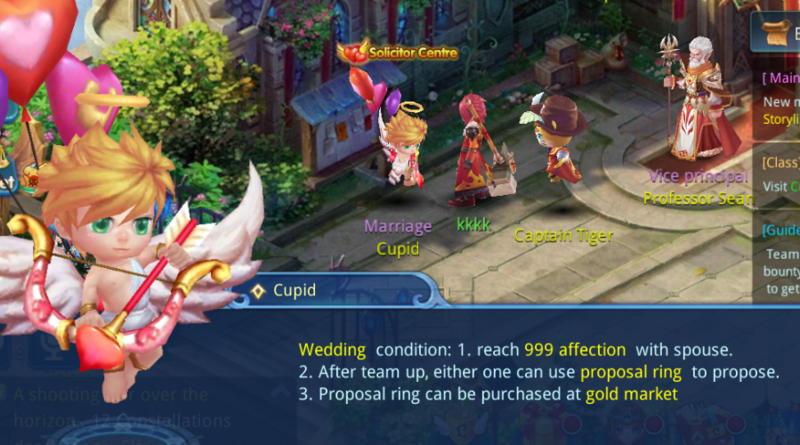 Players can purchase the engagement ring from Gold Market, and rising the affection through sending flowers. Engage successfully can hold wedding ceremony, Wedding of True Love or Luxury Wedding. Conduct wedding ceremony can get candies and intimacy, however, Luxury Wedding will get [Heart Hairpin] to craft fashion suit. Couple can gift candies to other players. [Checking current wedding] used to check the condition of server marriage, if there’s new couple conduct ceremony, players can apply to join the ceremony. After marriage, couple will possess Couple Title to accept Love Quest. Love Quest is limit to accept, and if complete the quest will get Exp, Affection, or Love.